We adore Barney and this movie was great. My son sat in awe when he heard other languages being spoken. I love the idea of Barney traveling and seeing other cultures. 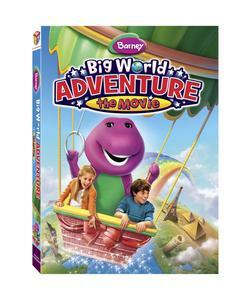 If your a Barney fan this is a great movie to own on DVD to share with your little ones. It's a super-dee-duper journey of dinosaur-ous proportions when Barney™ and his playground friends take a balloon ride around the world in the all-new Barney: Big World Adventure - The Movie coming to DVD, Digital Download and On Demand September 13, 2011 from Lionsgate and HIT Entertainment. This colossal adventure features preschoolers' favorite loveable, huggable T-rex, Barney, on a trip to Spain, Kenya and China where he meets new friends and learns about various cultures. Trusted by moms and adored by children, Barney displays sharing, caring, imagining, dancing and learning on television, online and through live events, home entertainment, toys and publishing. The Emmy® award-winning series, Barney & Friends™ is one of the top-rated preschool shows today, airing on PBS KIDS® and Sprout®. I thought this movie was perfect to watch at this point in my sons development. He has been playing hide and seek with me this last month. He will go hide in places I have cleared out for him to be baby safe for him. I don't like him to feel that everything is not for him so we had two drawers and one hall cupboard just for him. he makes me laugh so much when he hides in the hall cupboard I can see his feet sticking out and when I ask "wheres my baby?" he giggles and squeals. He even hides being his bed and toy box. We never taught him Hide and Seek he just figured out that its funny to make it so mama has to come looking for him. Its super cute and he really likes watching Timmy Time. Ready or not, here he comes! Preschool favorite Timmy and pals Yabba, Paxton, Bumpy, Mittens, Stripey and the rest are back for five all-new, antic-filled, good-hearted episodes in Timmy Time™: Hide and Seek, available on DVD September, 20 2011 from Lionsgate and HIT Entertainment. With slapstick humor and not a single line of dialogue, "Timmy Time" follows a day in the life of preschoolers, where they learn lessons about friendship and trial and error to which every young child can relate. "Timmy Time" airs on Disney Channel's Disney Junior programming block for kids ages 2-7 and their families, airing in more than 99 million U.S. homes. The show is created by Aardman studios, the Academy Award®-winning creators of Wallace and Gromit. 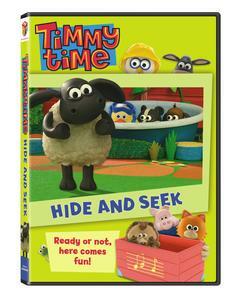 Come out, come out wherever you are to join Timmy and his preschool playmates for hide and seek and so much more! From finding the perfect hiding place for noisy Paxton to making paper boats with a sneezy Stripey, Timmy and his friends uncover adventure and surprises filled with fun and laughter in these five adorable stories that the whole family will enjoy. "Timmy Tries to Hide" - The class is playing Hide and Seek, but no one wants to hide with the noisy Paxton, who keeps giving them away. Timmy finally helps Paxton by hiding with him behind some hay-bales. But they're so well hidden that when it comes to Snack Time, no one can find them! "Timmy Gets the Job Done" - It's time for spring cleaning in the Preschool, but all Timmy wants is to go outside and play. Rushing his chores, he ends up making more of a mess, getting himself into trouble and being sent to sit on the Naughty Stump. Timmy finally learns to finish his jobs properly so he can join the others in their play. "Timmy Afloat" - The class is making boats, but Timmy has been paired with a very sneezy Stripey, who keeps ruining his efforts. When Stripey accidentally breaks Otus' boat, Timmy is forced to give the little owl his boat. Finally, Stripey's sneezing comes in handy and pushes the pair's new paper-hat boat to the finish line! Which do you like to teach your kids about more Dinosaurs or Farm Animals? *Limited to US residents; 18 years old and above. Giveaway starts September 16, 2011 and ends on September 26, 2011 at midnight PST. Winner will be emailed and has 48 hours to respond before another winner is selected. I was not paid for this giveaway or post. I was provide the item in this review for free by the company or PR firm representing them. The opinions on this item are 100% mine and may vary from others. We teach more about farm animals because we know more about them! My mom has a ranch with some horses, so we are pretty comfortable with farming stuff. Dinosaurs fascinate my almost 5 year old, but I feel like I'm learning right along with him! Liked Timmy Time on FB as Pixie Sprinkles! Liked Barney on FB as Pixie Sprinkles!